Matteo Ferraglia & Lorenzo Bianchini continue to lead the 2015 Italian Nats. They've been riding for a while the Australian built Windrush Edge with good results. I Hope they can attend to Kiel Worlds in some weeks along with Marco Radman and other top Italian riders. 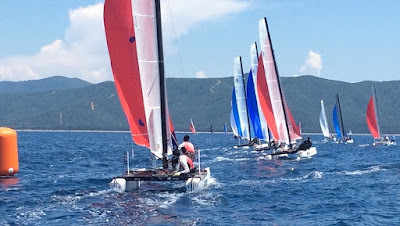 "Third Day of the Italian Nats 2015 at Punta Ala, hosted by Centro Velico Punta Ala. Light winds from the west, about 6 knots with better conditions only in the third race as wind intensity peaked 11/12 knots and rotated to WNW, with sunnies skies and mild temperatures. Punctual departure around 13:30 AM and return to the beach at 18 PM. Three races held today, 2 4 legs on the first two, and 6 for the last one held in more wind. 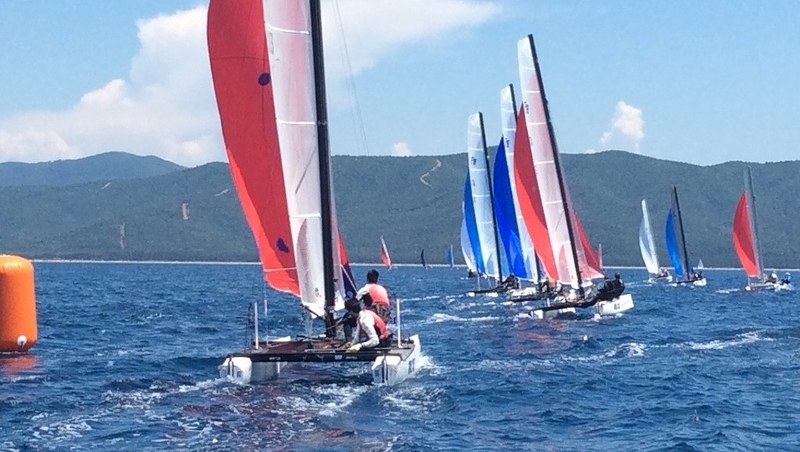 Overall ranking is still led by Lake Garda crew, Ferraglia&Bianchini, followed by Mazzucchi/Lisignoli in 2nd place and tied in 18 points with the leaders, in third place the Hungarian crew, Baro/Petheo. Close racing as seen in the scores above, and a few surprises. Tomorrow we will have the third day of racing and more windy conditions are expected. This year you have the chance to see the races online in real time using the GPS tracking , the service provided by the company U-Track. Standings, news and photos on Formula18.it"